For those interested, here is the full list of Texas Leftist endorsements for 2014. Some candidates will also have individual or group posts regarding their endorsement, which will be linked via candidate name from this post. If a candidate participated in this year’s Texas Leftist Candidate Questionnaire, that information will appear beside their party affiliation. 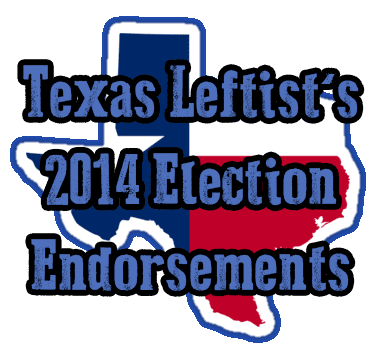 Texas Leftist has chosen to endorse candidates because they have demonstrated a commitment to advancing public policies that will improve the lives of Texans. Though each person’s individual positions vary, they are generally candidates that stand for equality, social justice, healthcare expansion, living wage, economic prosperity and common-sense governance. Today is Election Day!! Early Voting has begun for the state of Texas, and runs from October 20th until October 31st. For any questions on where or how to vote, check out this previous post or visit the My Texas Votes website. Though not endorsed by Texas Leftist, candidates Ron Hale, Ron Reynolds and Matthew Whittington did participate in this year’s Texas Leftist Candidate Questionnaire. Please consult their interviews for more information.